Citizen media outlets have captured the multidimensional essence of the Russian Orthodox Lenten season, which began Monday, including issues such the religiosity of post-USSR Russia, the liturgical calendar, the peculiarities of the Orthodox traditions and fasting rituals compared to those observed in the West, and the public statements made by prominent church officials. Four books contain the festal services necessary for the liturgical year. The Menaion  contains the feasts of the Lord, the Mother of God, and the Saints, for every day of the year. The Triodion  contains the services for Great Lent, the three weeks before, and Holy Week. The Pentecostarion  contains the feasts of Pascha through Pentecost and All Saints. The Octoëchos  provides eight one-week cycles of services in one of each of the eight tones. Pancake week/Maslenitsa celebration in St. Petersburg. Photo by YURY GOLDENSHTEYN, copyright © Demotix (26/02/12). 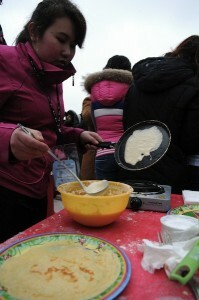 Russia is celebrating Shrovetide, or Pancake week, one of the jolliest, most vivid and fun-filled feasts here. The tradition of celebrating Shrovetide came to us from pre-Christian Russia. This is a feast of bidding farewell to winter, injected with the joyful anticipation of spring’s arrival, Nature’s awakening and the renewal of life. Shrovetide was the name of a straw effigy, dresses in women’s garments, which was first used in the general merriment, and at the end of the feast – burnt in a bonfire. An invariable attribute of Shrovetide were pancakes, round in shape – symbolizing the sun, and as such – a ritual dish. Ash Wednesday, in the [Gregorian] calendar of Western Christianity, is the first day of Lent and occurs 46 days before Easter. It is a moveable fast, falling on a different date each year because it is dependent on the date of Easter. It can occur as early as February 4 or as late as March 10. In Russia we have Clean Monday instead of Ash wednesday, it is also known as Pure Monday, Ash Monday, or Green Monday, is the first day of the Eastern Orthodox Christian and Eastern Catholic Great Lent. St. Nicholas Russian Orthodox Church blog provides  recipes for Lenten Main Dishes, while Orthodox Education Blog  includes a link to printable  Lenten coloring books for children. 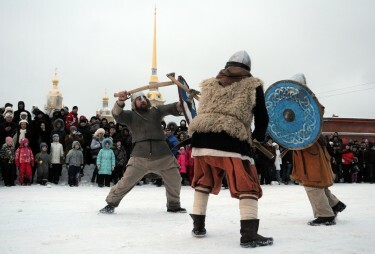 People fight with swords during celebrations of Maslenitsa or Pancake week, a traditional Russian holiday marking the end of winter, St Petersburg. Image by Yury Goldenshteyn, copyright Demotix (26/02/12). Ancient Faith Radio Blog posted  a 15-minute audio recording of Fr. Andrew Damick's discussion on the differences between the Eastern and Western Lenten traditions. In it he emphasized that Orthodox Christians observe lent more as a community and with the assistance of a confessor with the ultimate goal being to become more receptive to God's grace. For Orthodox Christians, he added, Great Lent represents a lifestyle that is merely intensified during this season. Global Voices introduced  Archpriest Vsevolod Chaplin as well as Patriarch Kirill in a January 2012 post entitled, “The Russian Orthodox Church Re-Enters Politics.” Similarly, both men have made public their views on how the Great Lent should be observed by Russians. Some in Orthodoxy pride themselves on being “luddites,” that is, as those who are generally against technological progress. This parallels those non-Orthodox Christians in America who see “www” as standing for “666.” On the other hand, some in Orthodoxy, including clergy, are quick to grab the first gadget to hit the market. With regard to the use of the internet, similar patterns may be seen amongst the Orthodox. Some Orthodox will avoid nearly all Orthodox-specific sites or at least any site that dares to address contemporary issues, believing that what matters is only “spiritual” things that can affect one’s soul and that there is nothing one can do to help with current difficulties within the Church. Others will engage any Orthodox site and/or blog and comment frequently, believing that such engagement is contributing to Orthodoxy or sometimes that such engagement is a healthy way to “vent” frustrations. Both approaches to the internet are wrong, even during Great Lent. What is needed is balance.